There are 7 reviews of Falling Into the Sea. Fruity, citrusy opening with a smooth, spa-like scent underneath. The drydown becomes very "beachy" and leans feminine to my nose. Pretty sure my wife would love to wear this as it resembles vacation with suntan lotion and spa products. Performance is good all around, with good, not loud, projection and longevity in the 5-6 hour range. After that, it's a skin scent into the 7-9 hour range after applying. The opening smells like fruits and screechy lemon based flor cleaner (and I normally like citrus in fragrances) with sort of a sun tan lotion vibe. A cheap smelling combination, though clean, that really gives me the impression that someone just moped the floor. It ends with a cheap tropical fruity sun tan lotion smell. Not at all my style, but OK. 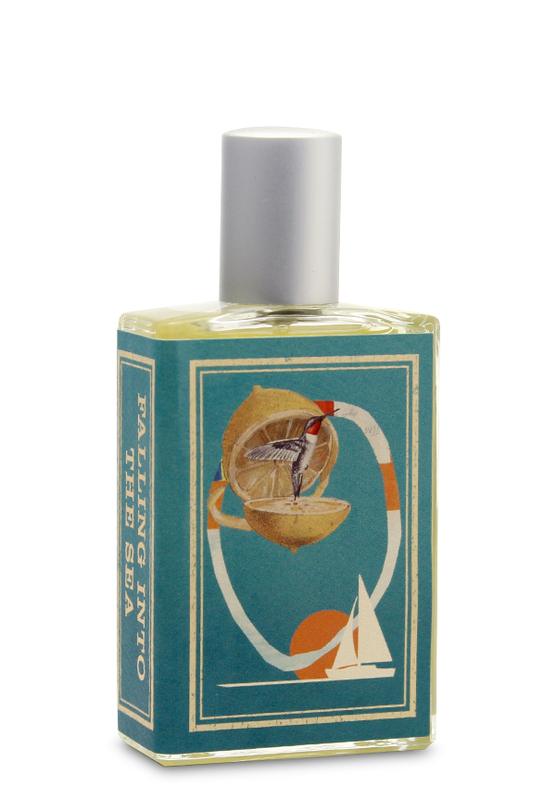 This is an opening that includes citrus, bergamot with a lovely lychee note, but soon all these are enveloped by an ozonic sea and beach impression that is uplifting and refreshing. Over time the citrus recedes, and the lychee grows stronger in my skin. The fruity and the ozonic balance each other very well. I do not get any distinct base note phase. The performance is excellent with moderate sillage, very good projection and a longevity of over ten hours. I'm doing a completely fun and stupid thing that has everything to do with my OCD and ADD; I'm reviewing TWO fragrances (one on each hand) simultaneously. Don't ask why. This is me. Anyhow, I want to eat my left hand. Why? Because that is where the fragrance I am reviewing right this second is located. It smells like Lychee fruit - fresh, on the branch you buy at the Korean grocery store across the city and it is worth the traffic and all the nonsense to get there. GOOD LORD! I want to eat my hand. 30 minutes...I think I smell some Neroli...very light. Lychee fruit is still powerful - it honestly triggers my salivary glands! Pretty spot on! Still get tiny whiffs of a floral, but nothing really powerful. This is only the second IA frag I've tested. I loved An Air of Despair. This one seems more one-dimensional. Linear, but not bad. I still want to eat my hand. After my horrible Pledge-like battle with Luxe today, I'm hyper-sensitive to lemon, and while it's in here, it is nothing like the hot mess I encountered earlier. I think I'll buy some lychee tomorrow. So, it's been about 2, maybe 2.5 hours, and I now smell the florals more prominently. They're nice, and I no longer wish to eat my hand. I think this would make a nice mid-summer decant. I shall think on it. Falling Into the Sea opens with a blast of mixed citrus and lychee, and the floral side comes out more in the drydown. It's a pleasant scent that isn't cloying citrus-y, sweet, or floral, so I imagine this should be pretty agreeable lighter, summer scent within the Imaginary Authors collection. Fruity (even citrus) and floral usually ring for me, and the case is the same here, but only slightly. A man could certainly pull this off as a summer day scent, as (although I cannot detect the sand note per se--it may be a bit of a joke like "tennis ball" in The Soft Lawn) it does remind me a bit of the beach, just not as much as Kramer's The Beach. Longevity-wise, it falls between Mosaic, which was disappointing (especially for an EDP), and the more wintry fragrances of Cape Heartache and Memoirs of a Trespasser, both of which showed great longevity. After 7 hours, a workout, and a shower, FITS still has some projection on my skin, albeit less than a foot. Not one I'll be buying, but still a good entry. There are no member images of Falling Into the Sea yet. Why not be the first?